A teacher once gave a simple test to her students. They were each given a sheet of paper with nothing on it except a small black dot in the middle. The teacher asked the students to write a short essay about what they saw on the paper. The students wrote about mistakes they had made, or things that aren’t right in life. They were quite imaginative about what might be represented by that small black dot. 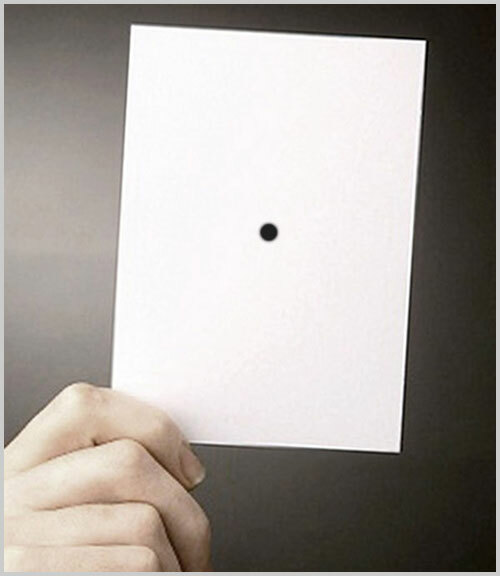 After the teacher had some time to examine the essays, she pointed out that every single student had focused on the black dot. No one had written about the rest of the sheet of paper. Their eyes were all trained on what they thought should not be there. In life, there is the temptation to dwell on the bad and ignore the good. The Bible urges us to look for the good and to count our blessings. Maybe this story will help us to do just that. “Finally, brothers and sisters, whatever is true, whatever is noble, whatever is right, whatever is pure, whatever is lovely, whatever is admirable—if anything is excellent or praiseworthy—think about such things.”—Philippians 4:8. This entry was posted in Christian Living, Leadership and tagged guard your mind, illustration, looking for the best, meditate on the good, negative attitude, Philippians 4:8, positive attitude, positive thinking, think good thoughts. Bookmark the permalink. 1 Response to What Do You See?